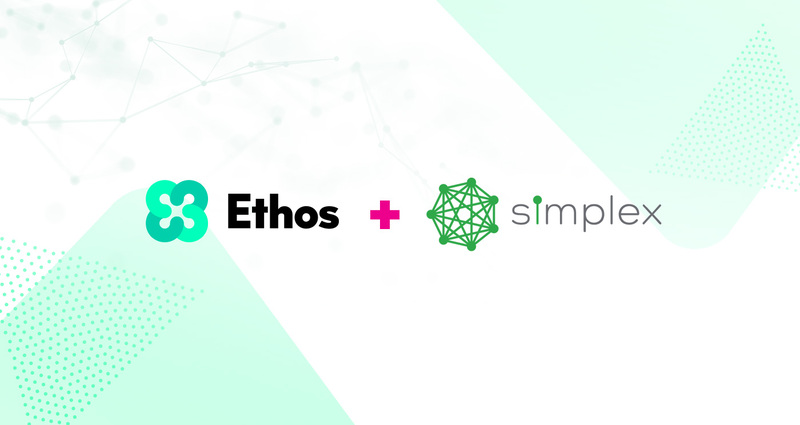 ​Ethos is pleased to announce an integration with Simplex, a global instant fiat purchase service enabling bitcoin and altcoin purchases with credit and debit cards. This integration will mean that Ethos customers will soon have access to liquidity and exchange services between fiat and cryptocurrencies on an international scale. Ethos aims to create a financial ecosystem that is open, safe and fair for everyone by harnessing the power and autonomy that cryptocurrencies provide. The Ethos Universal Wallet provides a secure, self-custodied mobile wallet where the user is in control of funds at all times. Ethos Universal Wallet gives users the power to store, track, send and receive more than 100 tokens. This agreement allows Ethos to accelerate the first phase of the fiat gateway and provide Ethos customers with a safe and seamless method for converting between fiat and cryptocurrency. Paired with the Shapeshift integration, users will be able to gain access to dozens of cryptocurrencies and tokens using fiat. "As Ethos expands its service offering, Simplex is proud to play a fundamental role in offering seamless, easy conversion between fiat and cryptocurrencies while ensuring transactions are completely fraud-free,” says Nimrod Lehavi, CEO and co-founder of Simplex. “We are able to achieve this thanks to our advanced machine learning AI algorithms and broad accumulated experience as security experts." The Ethos Universal Wallet is available in the iOS and Android app store worldwide. Download the app: https://www.ethos.io/universal-wallet/. Ethos is a leading cryptocurrency services provider that is building a bridge between the blockchain and existing financial institutions and systems. The Ethos Universal Wallet enables anybody to securely safe-keep their own crypto assets easily, safely and for free. The Universal Wallet is decentralized, allowing consumers to create their own private SmartKeys that secure their assets directly on the blockchain in personal digital vaults. The Universal Wallet is built on Ethos Bedrock, a foundation platform that makes blockchains more easily accessible, secure and compliant for both people and financial institutions. Ethos has built a blockchain dream team of financial and technology executives with experience at companies like Blackrock, Citrix, Deloitte, Freddie Mac, Merrill Lynch and UBS. Ethos is headquartered in Singapore with a global presence and community. Learn more at ethos.io. Simplex is a fintech company that provides online merchants with fraud-free payment processing. Our goal is to make online commerce safe. Based on advanced AI technology, Simplex’s automated system facilitates processing online payments while assessing risk with maximum speed and accuracy. Simplex integrates with online crypto exchanges to fulfill the credit card payment process. Hence, Simplex is responsible for risk analysis, processing the payments with the credit card company and finalizing the transaction. The cryptocurrency is provided by the online exchange. Learn more at Simplex.com. For more information, contact info@ethos.io.